More to the point, GM thinks that Baked & Wired has gained a reputation around town as the “true Georgetowner’s” choice: sort of a rebellion against the over-exposure of the attention-seeking Georgetown Cupcake. That appeal may explain why a neighbor–probably tired of seeing sweating tourists and suburbanites stand in line in front of his or her house–would decide to stage a tongue-in-cheek protest. On one level it’s pointless to compare the stores. They’re simply too different and but for the common thread of serving great cupcakes, they wouldn’t get mentioned together. But on another level, each represents a different vision of Georgetown: one the preppy and prim Georgetown of national reputation that draws tens of thousands of visitors here every year; the other the homey and funky Georgetown that makes living here worthwhile and that still exists in pockets despite the chain invasion. But maybe GM’s trying too hard to find meaning in layers of cream cheese frosting (bear in mind that August in a slow news month). Where do your loyalties lie? Once again, we should be grateful to have both shops in Georgetown. None has much to do with the other, as GM points out. One is a coffee shop and cafe, serving breakfast and lunch items as well as pastries, cakes, cookies, bagels and quiche. The other is a cupcake shop, with NO PRETENSE of being anything else. Both are excellent at what they do, both bring up the neighborhood, and both are owned and run by very pleasant and professional individuals. 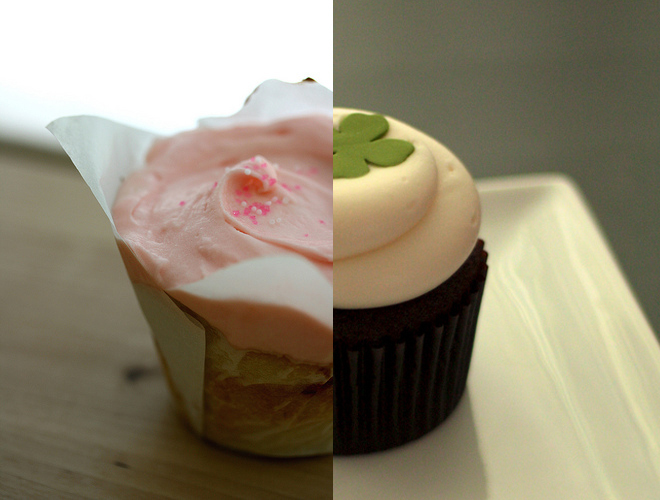 If Georgetown is hot to pit cupcake against cupcake, why restrict the competition to B&W and GTCC? Be fair. Include Furin’s, who had cupcakes long ago, and Dean & Deluca, who have them every day. Also, Safeway and Marvelous Market. There is a spiteful jealousy factor aimed at GTCC, which comes with success, but it should be noted the spite is not shared or expressed by the owners or staff at B&W. The lines at Georgetown Cupcake are there because its a unique hit. Once upon a time unique successes defined the village’s commercial area, rather than retreads and chains. Georgetown would do well to figure out how to attract more one of a kind hits.